The new MP for Stockholm’s Solna constituency. Hanif Bali’s family fled from political persecution in Iran, but the protection in neighbouring Iraq was short-lived. When the second Gulf War broke out, Hanif’s parents sent him to safety in Sweden with human smugglers. He landed in Stockholm, exposed and alone. If the 3-year-old boy could have looked twenty years into the future, he would have seen himself as a young and well-spoken Member of the Swedish Parliament. Before that, he would have gotten to know Sweden from north to south in thirteen different foster families. Since no one could certify his identity in Sweden, he had to wait until he was eighteen years old before he could become a Swedish citizen. Hanif laughs when he says: “When I came of age, I could testify to my own identity and tell the authorities that I had been Hanif Bali for eighteen years”. Hanif hurried to register for citizenship in time to vote in the elections of 2006. Hanif lived in foster families for sixteen years, and that has affected his views on the reception of unaccompanied refugee children. “We have to stop taking care of these children on an industrial basis. Putting them in institutional homes is not the way to integrate them into society”. “The best thing we can offer the children is placement in a family, where they can build strong social ties. We also have to realise that taking care of a refugee child could be a full-time task, and the financial compensation has to reflect that”. 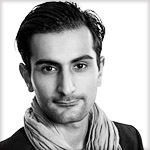 Hanif grew up mainly in Iranian foster families, but also speaks fondly of what it was like to live with a Swedish family in pastoral Gråbo, outside of Gothenburg. “It gave me the chance to experience what Swedish family life is like, and that meant so much to me”. When party colleagues in southern Sweden refused to receive refugee children, Hanif’s critique was merciless. “I don’t believe in agreements forcing municipalities to receive refugees, but the situation for unaccompanied refugee children is acute and we need more municipalities to take responsibility”. “It’s also important that integration efforts are carried out responsibly. I think municipalities who mismanage integration should be sanctioned”. In an article in the Swedish newspaper Aftonbladet, Hanif wrote: ”Politicians seem to believe that integration is popular treats with spicy food and music” and maybe that reflects the image many people have of the relations between Swedes and immigrants. “Can’t we just disregard whether people eat fish fingers or falafel at home?”, Hanif comments. “I think questions of multiculturalism and monoculturalism are irrelevant. Irrespective of whether people are from Somalia, Sweden or Iran, they get authority over their own lives if they work and earn a living for themselves”. “For refugees and immigrants, it’s also important to be part of the fellowship a work place can offer. It was at work a colleague invited me to join him for the midsummer festivities”. According to Hanif, integration has mistakenly been treated as a separate policy area in Sweden. “Where does integration fail?”, he asks. “Integration fails in municipalities that fail in other policy areas, on for example education and the labour market. A good option is to use the same model for natives and immigrants, like in my municipality Solna. Functioning integration policies are possible, but politicians need to understand what works”. 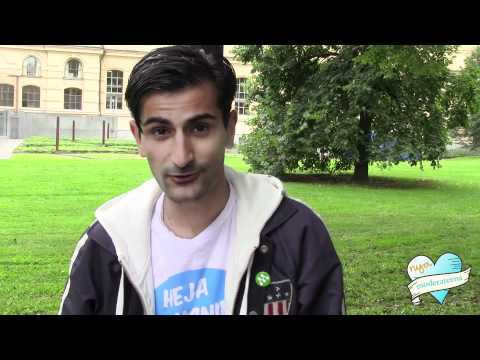 When asked about his dream vision of refugee reception, Hanif says that he would want refugees to come to Sweden not only to avoid persecution and war, but also because they know they will be able to build a future for themselves there. Hanif speaks enthusiastically about the will among refugees and immigrants to improve their lives and live like common Swedes. “Don’t look down on people striving for the Swedish dream of a house, a dog and a car. It’s a dream that is very difficult to realise for many people”. “Swedish society should give refugees and immigrants support and the opportunity to integrate. But you cannot get immersed into Swedish society without also wanting it and taking responsibility for it yourself”. August 2010 – Let Love Rule! Parliamentary candidate Hanif Bali introduces himself and explains why he will vote for Conservatives. 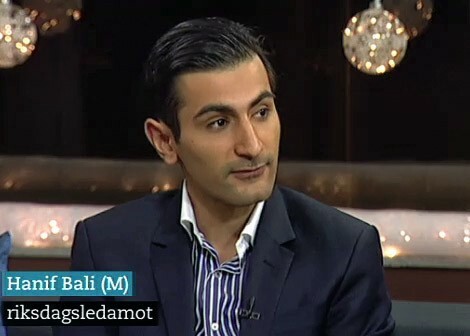 Hanif Bali is a member of the Moderate Youth Campaign Let Love Rule, politics has never been so fun!